Having expereienced an Edwardian and a Victorian Christmas, the final Beamish festive tradition is the Georgian Twelfth Night at Pockerley Old Hall. The Christmas season in the Georgian era, was still based on the Twelfth Night festival running from Christmas eve to the twelfth day after. It was a season of entertainment, delightful excitment and merry-making. The early 1800s witnessed a revival of Christmas with a focus on the nostalgia for ancient customs brought to the public in engravings, articles and even books depicting Christmas of the ‘olden days’. Key to this was the adaptation of medieval festivities to ‘modern’ tastes. There was wistfulness for the ‘hospitality’ of feudal society. In the late 18th century to early 19th century Twelfth Night celebrations were at the height of their popularity. Twelfth Night celebrations were based on the Medieval tradition of disguise, elaborate display and role reversal led by an elected master of ceremonies. The King and Queen who led proceedings could be selected through finding a dried bean and pea in the special Twelfth Night Cake, over time this devolved to picking characters from a hat. There were a number of different characters include ‘typical’ ones such as a gypsy and a flirtatious woman, little Jack Horner, Tom Thumb, Goody Twoshoes, Johnny Bo-peep, pilgrim, Turk, Jew, Jewess, witch, flower girl, fruit girl, hay maker, harlequin, clown and cupid. Who would you like to be? Key to Twelfth Night was the Twelfth Night Cake. These were sugar frosted and decorated with gilded paper, ribbons, laurel leaves, figures made of Plaster of Paris, paper or sugar paste. People would decorate their cakes as elaborately as they could afford. The less well off would have Twelfth Night iced buns. Shop windows displayed a fantastic array of cake and it was customary for people to go and see the window displays, like Fenwick’s! Through the 19th century the Twelfth Night cake turned slowly into a Christmas cake and by the end of the 19th century the only link to Twelfth Night celebration was leaving the decorations up until 6th January. The Georgians also held a number of interesting beliefs around the Yule log, the tradition had continued mainly unchanged for 100s of years. Georgian superstitions include it to be bad luck if a squinting person entered the house while the log was still burning, or a bare footed person or even a flat footed person! Some households also burned a Yule or Christmas Candle, if a Yule log was not an option. This candle was kept burning through the whole of the Twelfth Night season. The Christmas candle could be in the window, or consist of two large candles on the table or buffet wreathed in greens. 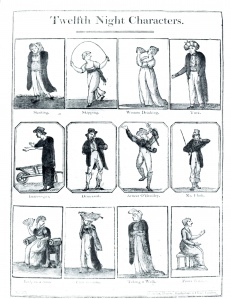 Records from Northumberland describe evenings of cards, singing and dancing through the festive season. Some families even hired in a piano for the singing and dancing. It was a time for the extended family to get together. Different amusements took place each evening. Typical card games included whist and commerce, board games such as drafts, chess and backgammon were also played. Popular games included Snap Dragon, this was popular from the 16th century right through to the 19th century. To play the game brandy was heated and placed in a wide shallow bowl, raisins were placed in brandy that was then set alight. The aim of the game was to pick out the raisins from the burning brandy and eat them without getting burnt. Don’t try this at home children! The Christmas holidays lasted longer, this is because the journey to visit the family took so long and in some cases guests did not want to leave. This often stressed the cook and housewife, especially with the varied and full menu that guests expected and the added pressure of possibly have snowbound guests. With no xbox or TV to watch it was up to the mistress of the house to make sure her guests were properly entertained. It was not unusual for farming families to put on plays in the barn, with the younger extended family taking all the parts, inviting all the neighbours and staff to watch the spectacle. It was customary for boys and girls to sing ‘carols’ door to door in return for small presents. Sword dancers still came around visiting with a Bessy (a man dressed as a woman) and a Fool. Charades was another popular Christmas activity. There were two ways to play the game, one was a relaxed parlour game, everyone was seated and each player in turn would recite a conundrum and the rest would have to guess the word. The other way was to split the party into two or more groups and once the word was decided upon the group would create short one minute acts to describe syllables. When you visit Pockerley Old Hall during the Christmas season why not have a go at the games in the Parlour. If by taking my all she effects her release! It was during the reign of King George III (1760-1820) that Christmas pudding first appeared in the format we recognise today. Some believe it was invented especially for him by his chef because of his excessive love of English puddings. Before this point similar ingredients were cooked as a sloppy pottage or porridge in a cloth. Puddings of all kinds were popular dishes during the festive season. They were easy to prepare and could cheaply fill many stomach of unexpected guests right up to Twelfth Night, such as rice pudding and apple dumplings. 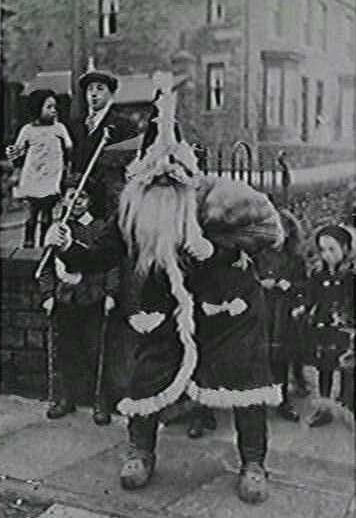 There are records of the ‘yule baby’ being made of the sweat meat given to children to commemorate the nativity still in the early 1800s in Northumberland, a tradition that had died out around the rest of the country. Gifts were given as a token of regard and ‘good cheer’. 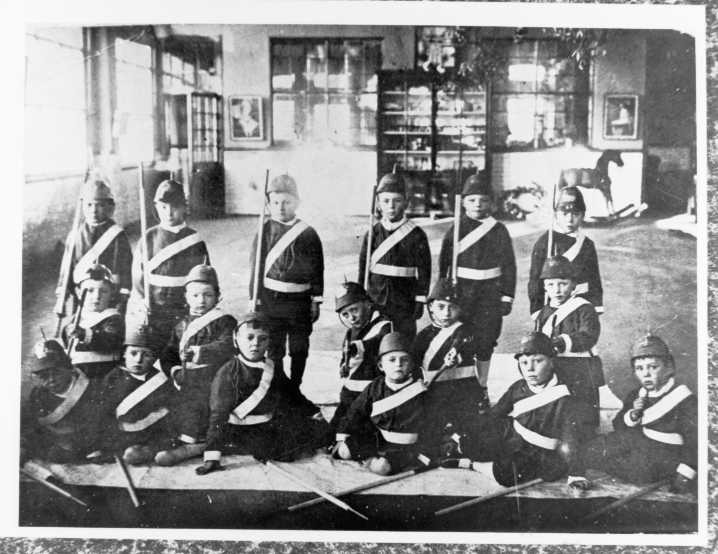 The Christmas box was still being given out to servants and children as a reward for good behaviour. These boxes often contained money. Gifts were also given on 6th December to commemorate St Nicholas, separate to the Twelfth Night or New Year gift giving which was accompanied with a poem. Charity was given to the poor, it was often worsted stockings, shifts and shawls, sometimes these were made by the ladies of the house. It was traditional for the poor to visit the clergy, well-off and squire for seasonable charitable gifts such meat and corn. Houses were decorated with greenery, not a huge amount, but ivy, holly, laurel and bay, in addition to mistletoe. Gentlemen were seen with Christmas greens in their buttonholes. It was hung from the ceilings in bunches, tucked behind items on the wall or the clock and even laid in the windows. Family portraits were decorated particularly with ivy and holly. If you visit Pockerley Old Hall during the Beamish Christmas season you will see the types of decorations they used. This entry was posted in Adventures in Collecting and tagged christmas, georgian, traditions on December 22, 2013 by BeamishMuseum. Over at Home Farm you will find Beamish is preparing for a Victorian Christmas. Here you will find many of the traditions of a modern Christmas are beginning to immerge. Christmas changed massively during mid 19th century and although this is often attributed to two men – the Prince Consort and Charles Dickens, the developments that took place were much too complex to be down to individuals. Instead it was part of the profound changes which revolutionised economic and social relationships along with the general outlook on life with renewed emphasis placed on traditional virtues of neighbourliness, charity and goodwill. Christmas became a mainly family festival, centred mainly on the children. This new style of Christmas developed first among the urban middle classes and included more presents, elaborate decorations and grander food, home made wines would be drunk, music and games played. There are several traditions familiar to us today which grew during this time including the use of fir trees, seasonal cards, carol singing. There was also some older traditions which originally belonged to the winter solstice, December 21st, that became a part of the Victorian Christmas like the Yule log, great meals and evergreens. The Yule log and Yule candles were burned on Christmas eve and it was considered most unlucky to light before the proper time. Yule log and evergreens – symbol of country Christmases – decorated and then burned on the fire – typifying warmth light and cheer, were lit with the remains of the previous year’s Yule log, which would be carefully stored. It was also noted that in farmhouses of the North, servants lay a large knotty block for the Christmas fire and drank ale and cider for as long as it burned. Holly – a male emblem brings fortune and fertility to the household and ivy, of clinging habit is the feminine symbol. It was only considered safe to bring inside on Christmas Eve and then only by a man. I wonder who brought the ivy in at Home Farm? Man and master dined together on Christmas day – after visiting stable and cowshed with special feeds. In Cumberland, every cow and horse had a ‘Christmas Sheaf’ in its stalls and sometimes another was nailed to the barn roof for the birds. In some cases a miniature wheat sheaf of gleaned corn hung from the kitchen rafters ready for Christmas Frumenty (boiled barley, milk & sugar). Once finished on New Year’s Eve, no more was made until the following year. St Stephen’s Day, December 26th was a time for rural sports. Meets of foxhounds took place everywhere which was more for a sociable meeting with friends than for serious hunting. New Year was often marked with church bells. In the North, just after midnight, came the important knock of the first footer, a dark man and nominally a stranger, who enters green sprig in hand, bringing luck to the house. Ashes are cleared from hearths for a ritual beginning, and silver, bread and coal brought in, symbolising wealth plenty and warmth. The customary philosophy was: ‘take out, then take in, bad luck will begin. Take in, then take out, good luck will come about’. William Henderson, warming himself in a Durham farm kitchen on New Year’s Eve about 1860, heard the mistress sternly threaten with instant dismissal any servant who took anything out of the house next day; domestic rubbish was carefully kept indoors until 2nd January. I wonder if I could get away with that kind of attitude this year? By Twelfth Night all decorations had to be removed from houses or bad luck was believed to follow and all greenery had to be burned outdoors. Do you still leave your decorations up till Twelfth Night? On Christmas Day many of the dishes eaten would be familiar to us, the roasted bird, Christmas pudding, Sausages and stuffing would accompany the meat and brandy sauce with the pudding and crackers as much of the good things we can eat with as many friends and family as we can gather. However, some things were different for example it was common to open roast the bird before the fire rather than cook it in an oven. There was also some other parts of the Christmas meal that was new – sprouts were not widely available until late 1880s and potatoes, slow to be used in British diet, were mainly boiled or mashed, not roasted. Although personally I would be quite happy is sprouts were still not widely available. A large game pie was a staple of wealthy Victorian tables at Christmas. All game was the property of those who owned the land and tenant farmers could not legally kill wild game that wandered over their rented fields. A present of game from a landlord was much prized – more than the financial value – it spoke of good relations with one’s social superiors & a taste of privilege. I wonder if they have one at Home Farm? Mince pies traditionally contained meat but by mid to late Victorian period the dish was changing and pies without meat were beginning to take favour with the upper classes. Victorian recipes vary, some have as much as 50% meat others none at all. Sweets were popular, whether home made or shop bought and popped into pretty home made gift boxes and hung on Christmas tree. For many years people had brought boughs of holly and ivy into their homes to decorate them with wreaths and garlands, however as the 19th century progressed people wanted more elaborate methods of decoration. Well decorated homes also had table centre pieces, wall treatments, lamps, picture frames and banisters were also decorated. If you compare the decorations at Home Farm to Pockerley Old Hall you will there are many more. Decorations that could be made at home included Wax holly berries, ivy ribbon, holly rope Trees were becoming more popular and fir trees would be displayed on tables in a pot, with presents unwrapped in a display beneath or hanging on the tree with name cards. The kissing bough was also very popular with its globe of evergreens looped with ribbons, baubles, shining red apples and mistletoe slowly revolving below the draught of a candle. Carols had declined in popularity but by mid 19th century this was changing. Many only survived by being orally handed down from generation to generation and were sought and collected by antiquarians, including ‘The Holy and the Ivy’ and ‘I Saw Three Ships’. A successful collection was ‘Christmas Carols Old and New’ published in 1871 by the Rev. H R Bramley. Victorians had a lively storytelling tradition – not just for children. Ghost stories enlivened many a Christmas evening, as families gathered together at home. For those with less imagination stories could be read aloud, Dicken’s ‘A Christmas Carol being particularly popular. On the other hand Christmas cards were big business by the 1870s and company’s commissioned Royal Academy members and well known illustrators to produce cards. However, the market was dominated by cheaply produced lithograph cards often adapted from Valentine cards. 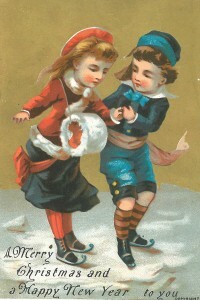 This entry was posted in Adventures in Collecting and tagged christmas, traditions, victorian on December 20, 2013 by BeamishMuseum. With only two weekends of the Beamish Christmas celebrations left, I though it was time to share some of background to what is going on at the Museum. Following in the traditional of Charles Dickens we are sharing with you Christmases past, actually three different periods of history. The Georgian era, that focuses on Twelfth Night celebrations at Pockerley Old Hall, the late Victorian era at Home Farm and the Edwardian era in the Town and Pit Village. Edwardian Christmas celebrations ranged from simple and home-made, seen by candle and oil lamp, to the middle and upper classes celebrations with electric lighting with shop bought decorations and gifts. Christmas was growing into a commercial celebration though its roots go back to the much older traditions and customs from feudal society. It was Prince Albert’s enthusiasm for Christmas that popularised the celebration through the press. With early trees being placed in pots on tables with presents left unwrapped under the tree or on the tree with little tags to identify the recipients, Miss Smith in the Ravensworth Terrace still has a small tree in a pot. By the 1880s the Norway Spruce was being used as a large floor standing tree. Popular authors of the day such as Charles Dickens idealised these Christmas celebrations. Decorations were often homemade. Paper chains and greenery were used to decorate many homes and businesses. The quantity and quality of decorations was very different between the wealth of for example the Dentist in the town to the pit village cottages. The Dentist has electric lighting and a floor standing Christmas tree, with all the trimmings of shop bought toys. The pit village families have a small table top tree, with homemade decorations and gifts. They rely on oil lamps and candles for light, you can understand why people had to make the most of the day-light hours! Hedworth Lane Infants School, Boldon Colliery, 1905. Hanging from the ceiling are bunches of mistletoe and at the back of the hall, left of the rocking horse, is a wreath ready to hang up. Illuminations were in their infancy during the Edwardian period, with not everywhere having access to electricity. The famous Blackpool Illuminations begin in 1879, before even Edison’s electric light bulb was invented. By 1912 the first of the modern style displays was opened with ‘festoons of garland lamps’ using 10,000 bulbs opened by Princess Louise. This proved so popular that it has continued ever since. The display in the Beamish town street may appear small and unimpressive to modern eyes, but with the use of electric bulbs still being an exciting experience, the display would have been very impressive and exciting to the Edwardian eye. The Masonic Hall, when in its original location in Sunderland, won awards for its illuminations for Queen Victoria’s Diamond Jubilee. 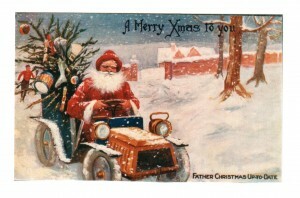 Father Christmas was a universal figure by 1910, in his red suite. Though before this time Father Christmas could be seen in a blue, green or red outfit as he is a merging of two figures, Father Christmas and St Nicholas. 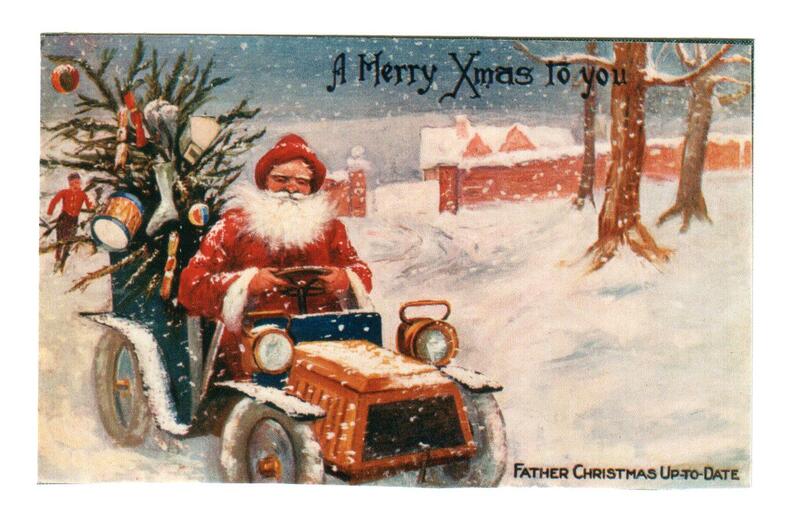 This 1910 Christmas card show a very modern Father Christmas, in his red outfit, driving a car and even uses the work xmas. Though many people think this is a modern term its use dates back to the early 1800s. There were a number of other traditions that still continue today, which were well established even by the Edwardian era. Christmas cards were first commercially produced in 1843 by Henry Cole and in the 1870s cheap rate postage led to a dramatic increase in the sending of cards, so during the Edwardian period card giving was commonplace, if you are visiting Beamish over the Christmas season wy not have a go at making cards in the Town or Pit Village. Carols too had gained popularity in the mid 1800s and were widespread by the Edwardian period. Between 1900 and 1920 Christmas became increasingly commercial; there was a dramatic increase in the giving of gifts to children and Christmas trees. The ‘Book of the Home’ explains how to decorate a Christmas tree in the early 1900s, with bon-bons, toys, dolls and baskets of sweets, brightly decorated and glittering. Christmas stockings first appears in the mid-1800s as an American adaptation of a Dutch tradition, with stockings being hung on the bed or hearth. In 1881 one magazine describes a little boys stocking as having; 2 bags of sweets, pocket knife, oranges, almonds, raisin and 2 jockey’s caps. 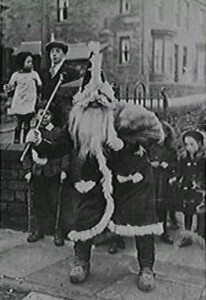 A 1913 Father Christmas on his was to visit a local infants school somewhere in the north east, this image is from the Beamish photo archive. This entry was posted in Adventures in Collecting and tagged christmas, History, traditions on December 14, 2013 by BeamishMuseum.